Are you still paid to interrupt? It seems that this is the approach a lot of marketers (or perhaps, more specifically, advertisers) take towards new technology – they use it to interrupt people in slightly new ways. Flat panel TVs can be placed almost anywhere, so the advertising world decides that they should be placed most everywhere. My bet is that, in many situations, these are rather unwelcome distractions. 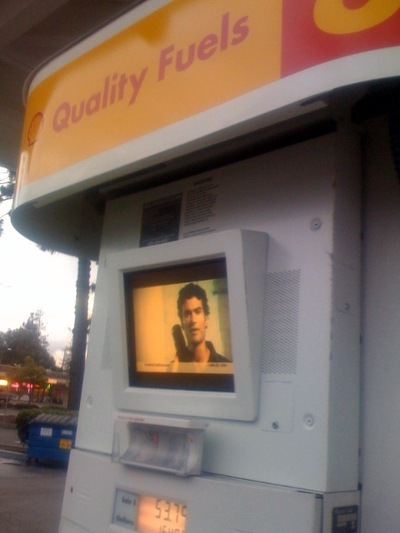 Case in point: Irving Oil, here in Atlantic Canada, rolled out audio attachments to their gas pumps a few years back. Once you started pumping, the ads started streaming. Until, of course, you turned it off. Or, as one gas attendant told me here in Halifax, some people went so far as to beat the device off of the pump and throw it in the trash. As we move ever closer to reaching peak attention, I think many marketers find themselves half-pregnant. While they may understand that permission-based community participation / engagement is a better way, they’re still paid to interrupt.